When I lived in Belgium and September rolled around, our family could purchase grapes just down the road. And these weren’t just any grapes. They were large and sweet and maybe the best grapes in the world. The farm where they were grown sat next to the sugar beet fields. A sign posted by the edge of the road would let us know that they were available. We would park by the red brick house and the farmer would come out with her pair of scissors and lead us back into a long greenhouse where the grapevines twined to the ceiling. The grapes hung heavy and plentiful in that warm and protected glass house. We would point to the bunches we wanted and she would cut them, weigh them on her scale and gently carry them to a counter where she carefully wrapped them in white paper, sometimes adding a gold label with the name of the grapes. We were fortunate to live in an area known for its glass greenhouses and its grape farmers. And to this day, the neighboring town of Hoeilaart still has a grape festival every year, though the grape farmers have dwindled. Once I moved to this area, I discovered another kind of grape. And at first, I didn’t quite believe in them. They were small, seedy and tough skinned. But they seemed to be a part of many of the places I lived. First, at what we called The Farm just outside of town, I spent a summer living with my brother and sister-in-law and along with their prolific garden, a grapevine or two along the fence line produced some fruit. Later, when I lived with my husband and daughter on a farm ten miles out of town, grapes were a part of our self sufficient life. We milked our cows by hand morning and night, used horses to farm, gathered eggs and sap, butchered, and the garden included a grape arbor. More recently, when we became townies, grapevines grew on our backyard fence. I was not always sure what to do with them: they were so different from the grapes I grew up with. But slowly, I found out. My father mentioned canning grape juice in his youth and then, my mother-in-law showed me how it was done. First, pick the grapes. Then, wash them. Then, pluck them off the stem and pop them into a bowl, keeping the skin and all. Put them in a jar with a little bit of sugar and boiling water and hot pack them. As I followed the steps, I discovered I loved the smell, the stickiness, the popping and the result. Out of the canner, the grapes turned a beautiful dark red colour, and later, when I opened up a jar to try, it was as though late summer had come knocking again, with the memories of yellow jackets buzzing around the ripe grapes as I stood in the backyard in the early autumn sunshine finding the hidden bunches beneath the large grape leaves. This year, I had to search for grapes since we no longer have any. 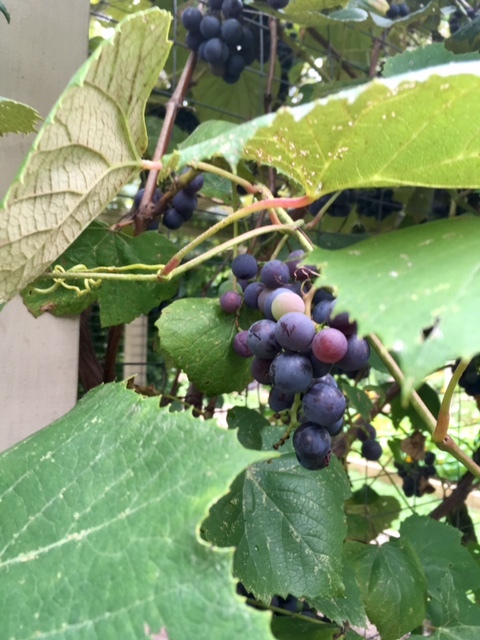 Luckily, the gardeners at the DeFries Gardens let me know that the grapes were thriving in their culinary garden, and I would be welcome to come and pick. So I did. 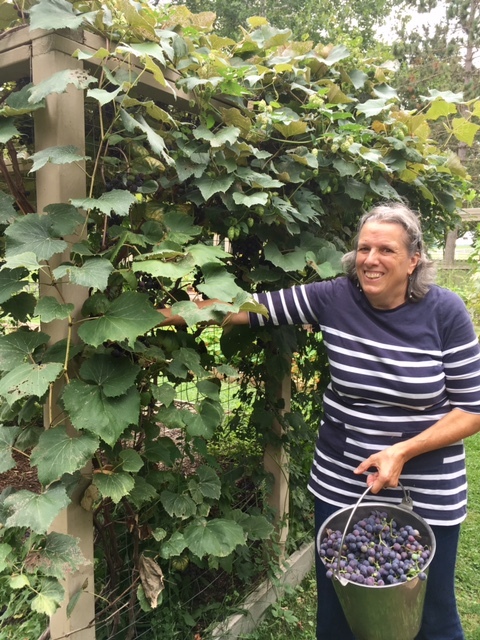 Only later did I realize that the bucket I had grabbed to collect the grape bunches was given to me by Beth DeFries, who donated the land for the garden and gave her name to it! I picked them at lunch and I canned them in the afternoon. Now they sit on the shelf with other fruits and vegetables, waiting to let out their stored seasonal memory. 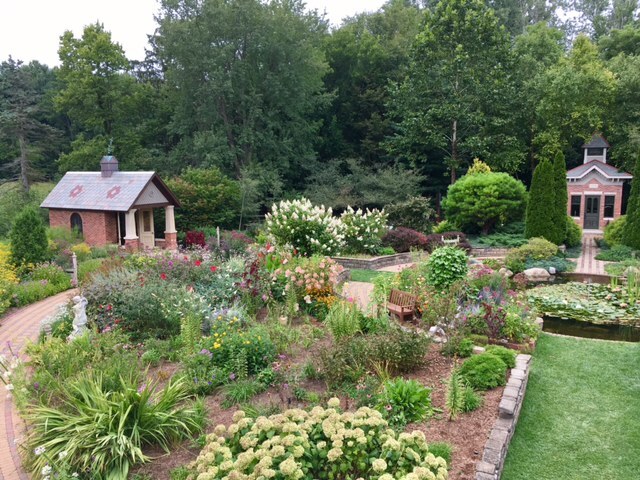 What comes to me, as I tell you this story, is that wherever we are planted, there are things to discover and enjoy, especially when it comes to food. Who knew that one grape experience across the ocean would lead to another here? But that is the beauty of taking in our local landscape, and continually learning new ways of doing, and tasting.